Identifying patients most at risk for hospital- and community-associated infections is one essential strategy for preventing infections. To investigate whether rates of community- and healthcare-associated bloodstream and surgical site infections varied by patient gender in a large cohort after controlling for a wide variety of possible confounders. All patients discharged from January 1, 2006 through December 31, 2008 (133,756 adult discharges and 66,592 pediatric discharges) from a 650-bed tertiary care hospital, a 220-bed community hospital, and a 280-bed pediatric acute care hospital within a large, academic medical center in New York, NY. Data were collected retrospectively from various electronic sources shared by the hospitals and linked using patients’ unique medical record numbers. Infections were identified using previously validated computerized algorithms. 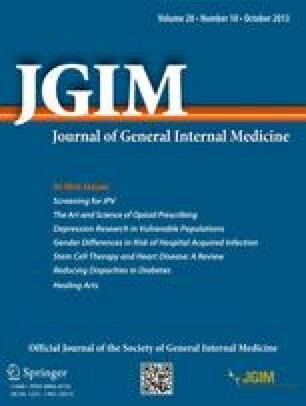 Odds of community-associated bloodstream infections, healthcare-associated bloodstream infections, and surgical site infections were significantly lower for women than for men after controlling for present-on-admission patient characteristics and events during the hospital stay [odds ratios (95 % confidence intervals) were 0.85 (0.77–0.93), 0.82 (0.74–0.91), and 0.78 (0.68–0.91), respectively]. Gender differences were greatest for older adolescents (12–17 years) and adults 18–49 years and least for young children (<12 years) and older adults (≥70 years). In this cohort, men were at higher risk for bloodstream and surgical site infections, possibly due to differences in propensity for skin colonization or other anatomical differences. The online version of this article (doi: 10.1007/s11606-013-2421-5) contains supplementary material, which is available to authorized users. We gratefully acknowledge Mandar Apte, Christie Jeon, and Matthew Sinisi for their assistance with data management and analysis. This work was funded by a grant from the National Institute of Nursing Research, National Institutes of Health (R01 NR010822). This work was presented at the Association for Professionals in Infection Control and Epidemiology 39th Annual Educational Conference and International Meeting in June, 2012. National Healthcare Safety Network (NHSN) [Internet]. Atlanta: Centers for Disease Control and Prevention. Available at: http://www.cdc.gov/nhsn/settings.html. Accessed February 20, 2013. Healthy Weight [Internet]. Atlanta: Centers for Disease Control and Prevention. Available at: http://www.cdc.gov/healthyweight/assessing/bmi/adult_bmi/index.html. Accessed February 20, 2013. Centers for Disease Control and Prevention. Monitoring selected national HIV prevention and care objectives by using HIV surveillance data—United States and 6 U.S. dependent areas—2010. HIV Surveillance Supplemental Report 2012;17(No. 3, part A). Available at: http://www.cdc.gov/hiv/topics/surveillance/resources/reports/. Accessed December 14, 2012.